SKU: WS255-AS. Categories: Funny Signs, Novelty Signs, Political. Tags: FBI Agent, Warning Signs. If your property is protected by an FBI Agent, let people know so they can expect to be wire-tapped and have any internet activity they do while on your property recorded. This sticker will also dissuade any thievery as anything could have a bug in it. Heck, even being on your property could result in a dossier with their name on it! Or their fingerprints could be sent to the FBI’s data campus in Clarksburg, West Virginia to be one more of over 96 million sets of prints. Scary stuff!!! 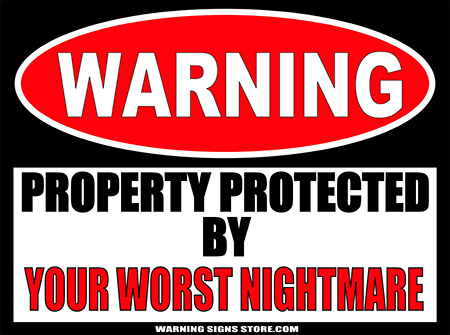 This sign should scare intruders and guests alike! 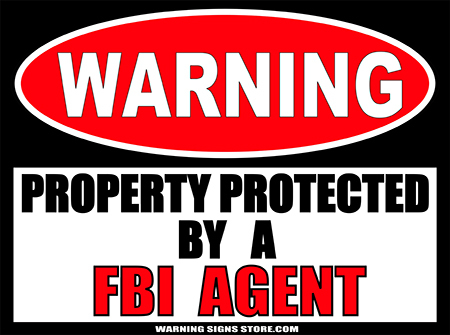 This Property Protected by FBI Agent sign measures out to approximately 9″x12″. It is printed in a glossy finish with eco-friendly inks on a premium vinyl polymer and backed with 0.040 gauge aluminum. Our inks are UV resistant and designed to last 7-10 years, indoors or out.